The wonderful thing about this meal is that it’s so quick and easy to prepare. 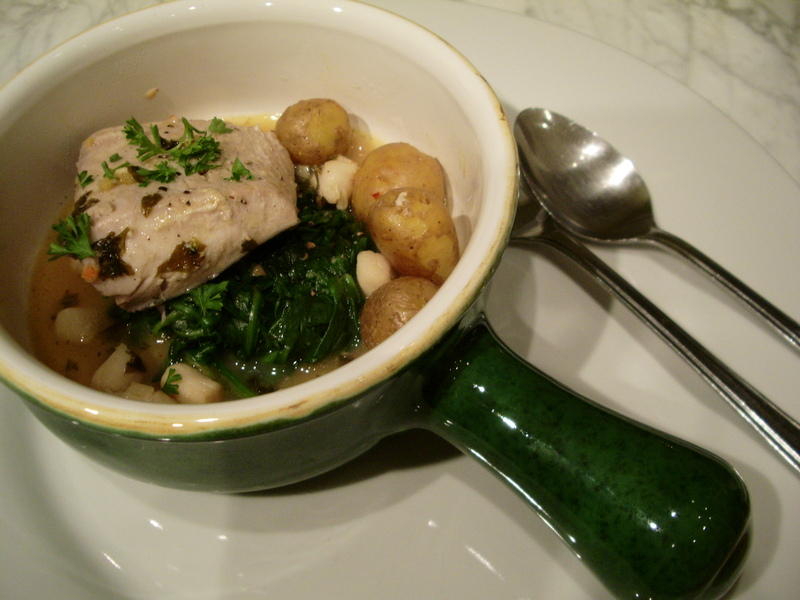 It also tastes great, and is a good, healthy choice – especially served with some fresh greens, such as wilted spinach. Most fish are a good source of low-fat protein, and many contain high levels of several vitamins and minerals (although this does – of course – vary between different types of fish). The choice of fish here is really up to you – any firm white fillets should work well. But, given the current pressures on many fish populations, I also think it’s important to consider issues of sustainability and environmentally friendly practices when making your selection. In the US, you can learn more about this through the Monterey Bay Aquarium Seafood Watch program, which offers a Sustainable Seafood Guide to enable better choices when buying fish and seafood, helpfully recommending ‘Best Choices’, ‘Good Alternatives’ and which species to ‘Avoid’. In the UK you should look to the Marine Conservation Society, which includes a list of fish to eat / avoid. And if you’re interested, then have a look at Hugh Fearnley-Whittingstall’s Fish Fight, which campaigns on variety of related issues. On this occasion I chose mahi mahi, which is a source of several vitamins and minerals, including niacin, vitamins B-6 and B-12, phosphorous, magnesium and iron. It’s also low in fat, but in common with some other seafood is relatively high in cholesterol. Overall, it’s considered a good option for most people when eaten in moderation (pregnant women and children are recommended to eat fewer portions). And although some should be avoided because of fishing method and location, US Atlantic mahi mahi that’s caught by trolling (not trawling) or pole and line is considered a ‘Best Choice’. And anyway, mahi mahi is a great fish to cook in a recipe like this – it’s firm and has large, moist flakes with a slightly sweet and mild flavour. The little bay scallops are similarly sweet, and are at their best when thrown into a pot of flavours like this. If you don’t want to bother with the potatoes then you can serve it instead with some crusty bread, which will also male the preparation time even quicker. Par-boil the new potatoes by putting them into a pan of boiling water for five minutes. Heat the olive oil in a large frying pan over a medium heat. Add the par-boiled potatoes and leave them in the pan for 5 minutes, shaking occasionally to prevent them from sticking, but allowing them to colour slightly. When they’re beginning to brown, add the garlic and leave for another two minutes. Add the wine, stock, half the parsley, a good squeeze of lemon juice and some freshly ground pepper. Bring to the boil and allow to simmer for another 5 minutes. Add the fish to the broth and leave to simmer for 5 more minutes. Scatter the bay scallops into the pan and leave for another 5 minutes. While the scallops are cooking, prepare the spinach by washing it thoroughly. While it’s still wet and dripping, place it in a shallow pan over a high heat, placing a tight-fitting lid on top so that the spinach cooks in its own steam. Lift it out, squeeze dry, and divide between two serving bowls or plates. Season the fish with some more pepper, and add more parsley and lemon juice. 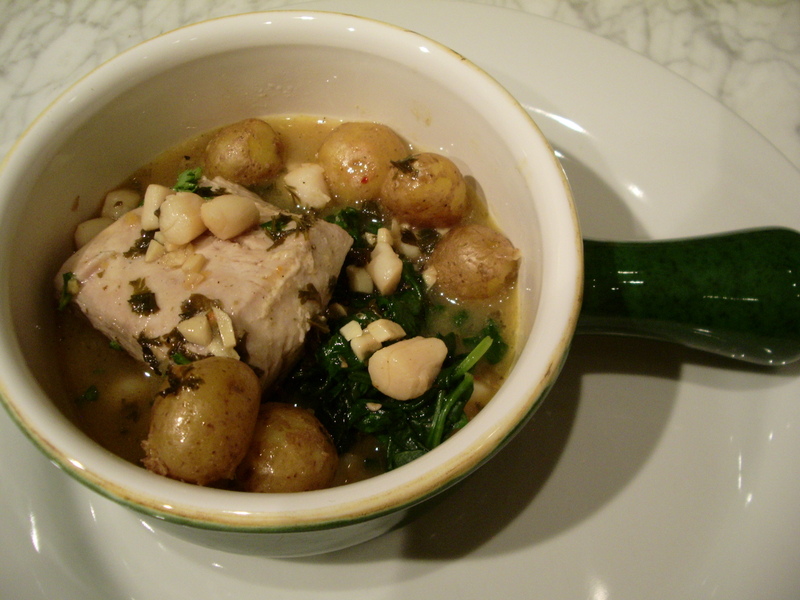 Place the fish fillets on top of the spinach and spoon the scallops, potatoes and broth over the top. Serve with more lemon juice and parsley if you fancy it. 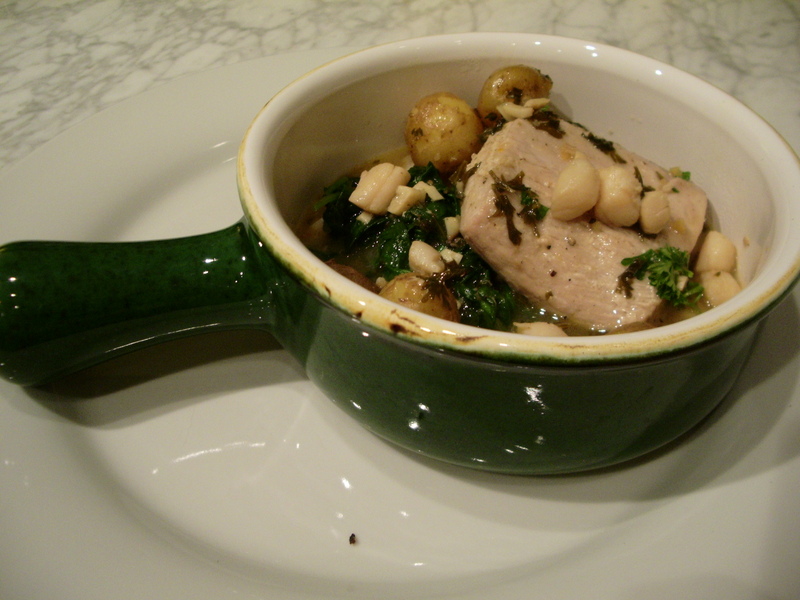 This entry was posted in Fish, Food, Nutrition, Recipes and tagged Bay Scallops, Fish Fight, Mahi Mahi, Monterey Bay Aquarium, spinach, Sustainable Seafood Guide. Bookmark the permalink. Thanks Phil – it’s a really enjoyable meal. And yes, it’s VERY important to think about issues of sustainability here as well.